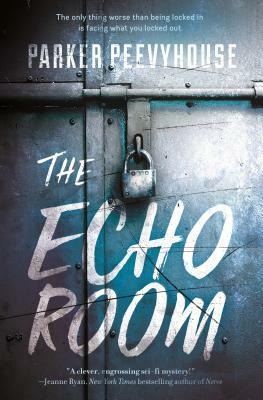 Parker Peevyhouse's The Echo Room is a smart, claustrophobic, speculative young adult thriller with an immersive psychological mystery. The only thing worse than being locked in is facing what you locked out. Rett Ward knows how to hide. He's had six years of practice at Walling Home, the state-run boarding school where he learned how to keep his head down to survive. But when Rett wakes up locked in a small depot with no memory of how he got there, he can't hide. Not from the stranger in the next room. Or from the fact that there's someone else’s blood on his jumpsuit. Worse, every time he tries to escape, he wakes up right back where he started. Same day, same stranger, same bloodstained jumpsuit. As memories start to surface, Rett realizes that the logo on the walls is familiar, the stranger isn't a stranger, and the blood on his jumpsuit belongs to someone—or something—banging on the door to get in. Parker Peevyhouse is likely trying to solve a puzzle at this very moment, probably while enjoying In-N-Out fries, admiring redwood trees, and quoting movies about sentient robots. Parker's critically acclaimed collection of novellas for young adults, Where Futures End, was named a best book for teens by the New York Public Library, Chicago Public Library, and Bank Street. The Horn Book called it “a smart science-fiction puzzle.” Parker lives in the San Francisco Bay Area and works at Hicklebee’s Children’s Bookstore.